Edward Gorey’s The Gashlycrumb Tinies is my absolute favourite of works — I get to die first, after all — and so when I was experimenting with my Micron pens the urge to parody BBC’s new Sherlock by mashing up the two was irresistible. Click the image if you’d like to really see the ridiculously obsessive line work, or just enjoy the smaller version where it all blends into a texture. I decided to combine the pose from “S is for Susan who perished of fits” and the caption and setting from “N is for Neville who died of ennui” in order to capture the essence of modern Sherlock in his state of utter boredom. The window isn’t precisely true to the show (there’s an ornate railing of some kind outside, and curtains), but I really liked the boring brickwork from the N page, so I copied that faithfully and tediously. 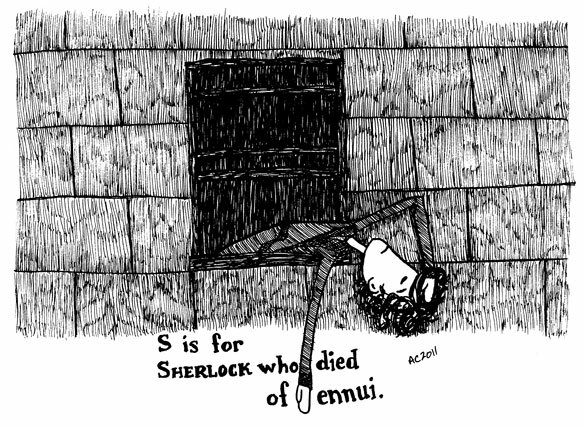 S is for Sherlock who died of ennui, 8.5″x6.5″ pen and ink on sketchbook paper, sold. 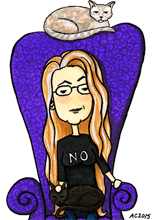 You can still get the pair of them as handmade blank greeting cards on Etsy, though! I want this so bad I have no words.